Four rockets fired from the Gaza Strip hit the Hof Ashkelon Regional Council late Sunday night. The Iron Dome missile defense system intercepted two rockets and two hit open areas. No injuries or damage were reported. Another two rockets were launched at the Bnei Shimon Regional Council. Both exploded in open areas and no injuries or damage were reported. In response to the rocket fire, Israeli aircraft attacked in Gaza overnight, and Defense Minister Moshe Ya'alon ordered the closure of the border crossings between Israel and the Hamas-ruled territory. The IDF estimates Islamic Jihad was behind the rocket fire. Following a meeting with top Southern Command officials and the head of IDF intelligence, Chief of Staff Benny Gantz instructed the army to launch airstrikes against four terror targets in central and south Gaza. The targets, including a rocket-launching pad and a weapons cache, belong to Islamic Jihad. The terror group apparently launched the rocket attack as an act of defiance against Gaza's rulers. However, the army is not ruling out the possibility that extremist Salafists were behind the attack. Tensions between Islamic Jihad and Hamas have been mounting following the recent death of an Islamic Jihad terrorist at the hands of Hamas' security forces during clashes. Islamic Jihad announced it was severing ties with Hamas for the time being. "We're pretty shocked at the whole thing," said Sigal Moran, head of the Bnei Shimon Regional Council. "I still hope it was a mistake and not the beginning of another era of emergency routine." "We thought we'd have some peace. I hope it was sporadic and will not repeat itself, especially now that the kids are entering the summer vacation." Air raid siren sounded in Rahat, Beersheba, Lehavim Regional Council and Shaar Hanegev Regional council. Local residents reported to hearing blasts. Rahat Mator Faiz Abu Sahiban said "I heard the sirens and then a boom. Residents were panicked; people keep calling me all the time. It's been a while since we heard sirens but we're always alert. 'I don’t know what's happening in Gaza right now; I'm still waiting for instructions from the Home Front Command so as to calm everyone down." Last week, an alert siren sounded in the Hof Ashkelon Regional Council area, but no hits were detected. 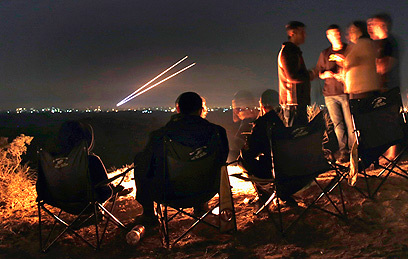 Palestinians in Gaza have fired several rockets since an informal ceasefire took hold after Operation Pillar of Defense. See all talkbacks "6 Gaza rockets hit south; IDF retaliates"